Five fires reportedly raging at points in Beeri and Kissufim forests in southern Israel. Five different fires are raging in the southern region of Israel, 0404 reported. Three of the fires are in the Beeri forest, while the two others are in the Kissufim forest. Extensive damage has reportedly been caused to the forest regions. Firefighters and JNF workers are currently acting to subdue the fires. 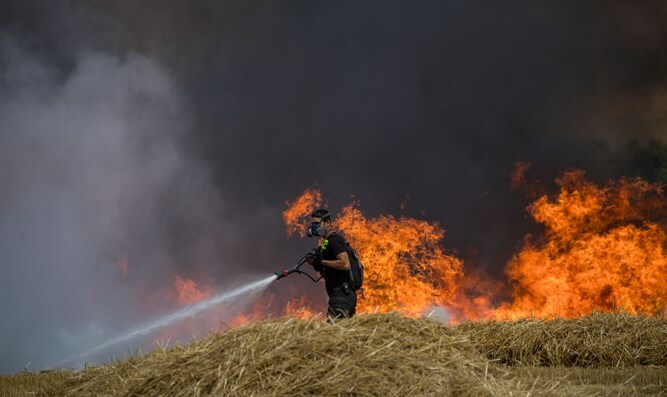 In another incident, an incendiary balloon was located in a field in the southern agricultural community of Nir Akiva in the Merhavim regional council, 0404 reported. A bomb disposal expert was called to the scene and neutralized the threat. The Merhavim regional council pointed out that incendiary balloons have been located in a string of Gaza-area communities over the course of the week, according to the report. On Sunday, an incendiary balloon was found in a populated area of the city of Sderot. Police bomb disposal experts called to the scene were able to neutralize the threat.